Last weekend, I was at the market, paying for a cart loaded with fruits and vegetables, as Logan stuffed his face with strawberries faster than I could pass them to him. The lady in front of us looked at my cart and said to me, "wow, he must be the best fed kid on earth". And I just had to chuckle and think just how ironic it was that she said that. Little did she know that he had been seen at the Pediatric Feeding Program just the day prior for resistant eating. I just smiled politely and responded "yeah... he actually doesn't eat all that much". To which she responded, "well, it looks like you give him lots of opportunities to see you eating good foods. So I'm sure that he'll start eating well too". This is the traditional wisdom around picky eaters. Just keep presenting them with the foods they don't like and they will most likely eventually try them. And probably even learn to like a few. Unfortunately, this isn't quite as true for resistant eaters as it is for picky eaters (see here for a distinction between the two). 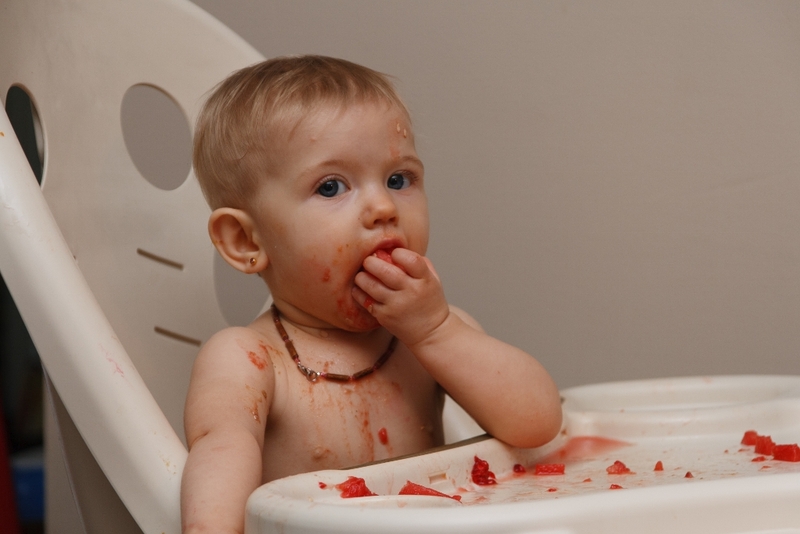 Though picky eating is a stage that most toddlers go through, without intervention, resistant eating persists beyond the toddler years. Just being patient and waiting it out doesn't work with these kids. The reason is that (at least in my opinion), a lot of these resistant eaters have some sort of issue that has contributed to feeding difficulties: be it sensory problems, oral-motor difficulties, reflux, food intolerances, celiac disease, etc. These kids need a special approach to encourage them to increase the types of foods they will eat over time. Though people always say that a child will not starve themselves to death, in fact, 4-6% of children will not eat, regardless of their level of hunger (either because it is just too difficult for them, or because it hurts them too much). 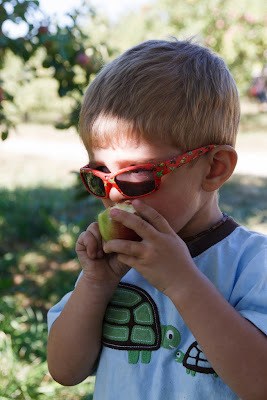 I wanted to share some of the tips for picky/resistant eaters that we've picked up along the way, to help out others who are experiencing feeding challenges with their little ones. As much as we learned them in the context of our little resistant eater, I'm sure they'd be helpful for picky eaters too. Our OT mentioned that there are 32 steps that a resistant child needs to go through before they will accept to eat a new food. So clearly, eating can be a complex process for these children. If you don't respect letting them slowly work their way up the hierarchy of steps, you are not going to be successful in having them accept new foods. Now, I don't know all of the steps just yet. We are still learning and I'm sure that I'll do another post down the line as we learn new strategies to help our little guy. But I wanted to share some of the things we have learned so far that have worked well for us. We've gotten some of this info from our OT and some from the book Finicky Eaters: What to do When Kids Won't Eat. These are not things that you will necessarily have to do with every child. But if your child is struggling with eating, I am pretty convinced that trying to incorporate some of these techniques might help. Or, at least, it did for us. 1. It is up to the child what and how much he eats. No pressure should be placed on the child regarding whether or not he is eating or what he has chosen to eat from his plate. I put this point first, as I feel that it is the cardinal rule. If you don't follow this one, I think that you're only heading for more trouble with these tough kids who are already digging in their heels, not wanting to eat. As I remember reading somewhere, it is your job as a parent to provide adequate and nutritious food to your children. It is entirely the child's responsibility to decide whether or not to eat, what to eat of the foods that are offered, and how much. I cannot tell you the number of times I have bit my lip, or perhaps even made a quick comment as someone sitting with us has repetitively said to Logan, "eat your chicken, Logan". Eating needs to be pressure-free. A non-issue. You don't want to give any attention to what or how much the child is eating. Now, of course, I still pay attention to these things. But I don't let on to Logan that I am paying any attention at all to his eating. My attitude towards him is, "Eat if you want, don't if you don't. That's fine." Said in a way that conveys that he truly has the control regarding these decisions and that it's not secretly annoying me (even if sometimes it is!). By the time he was maybe just past a year old, I had learned that he'll eat when he wants and that's just that. And the recent feedback from the psychologist was that this was the perfect approach to take. So if you are having struggles with your child not eating well and haven't taken this type of an approach yet, it's probably the first thing you want to try. 2. Never, EVER put something into your child's mouth without his/her consent. This point ties in closely with point #1. It is up to your child to determine whether or not he wants to eat. Forcing him to eat something that he doesn't want to eat is only going to turn things into a power struggle and won't get you anywhere. Imagine if someone randomly shoved something in your mouth that you didn't want to eat. I'm sure you wouldn't be too happy either!! 3. Let your child play with his/her food. Children need to be familiar with a new food before they will be willing to put it in their mouth. We have let Logan play with his food from the get-go, but our OT has confirmed that this was a great thing to do. We don't have many limits on what he does with his food, as long as he's not throwing it around the kitchen!! In fact, sometimes McQueen and Mater even eat some of the foods that he doesn't want to. The psychologist who we recently saw the Feeding Clinic told us that she doesn't disagree with these types of techniques to help encourage feeding, and is also aware that this is a typical OT technique. However, she also commented that we need to understand that this will create eventual behavioural challenges. This was already evident to me. At some point, we will have to lay our foot down with a "no more toys at the table" rule. And I'm plenty ready to do that, once he is eating well. In the meantime, I'm willing to allow it, on the grounds that it will apparently help him become more comfortable with putting new things in his mouth. 4. Only put one new food on your child's plate at a time. This helps decrease the child's anxiety with respect to trying new foods. Given that there is no pressure to eat specific foods, the child can become exposed to a new food (repetitively), while still having enough food on his plate that he accepts eating. Our OT mentioned that, for these picky/resistant eaters, each way a food is cut or cooked is considered to be a "new food". For instance, if the child eats steamed whole baby carrots, raw baby carrots, shredded carrots and diced carrots (raw or cooked) would all be considered to be a "new food". So even though the child eats steamed whole baby carrots, if you steam baby carrots and cut them into pieces, this needs to be placed on the plate as the new food, alongside other foods the child already eats willingly. 5. Serve only a very small portion of new foods. This way, your child will not feel overwhelmed at the prospect of a mountain of food that he doesn't like on his plate. Keep in mind that you want to be serving a small child-sized portion and not a small portion for an adult. 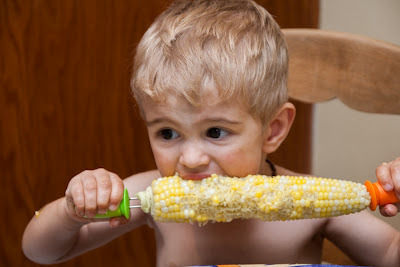 For instance, when we introduced corn, I probably put 5-8 kernels on Logan's plate. The child can always ask for more if they eat everything. And you can progressively increase portion sizes as the child accepts the new food. 6. Keep a little bowl on the side of your child's plate where he can put any foods that he doesn't want to be on his plate. If the child won't accept a certain food on their plate, serve that food on their plate, but let them know that if they do not want to keep that food on their plate, they are welcome to put it into the bowl instead. If they do not yet tolerate touching the food, encourage them to use a fork or other utensil. The child will eventually come to tolerate the food being on their plate. We were lucky that Logan began tolerating disliked foods on his plate very quickly after we introduced this. Though I am sure there are other children who will be more resistant. 7. Use a divided plate. My sister got Logan a "construction plate" for his birthday. Which is essentially a fun divided plate with some fun utensils. This helped us immensely. More than I could have imagined when she gave it to him. The minute a piece of corn or a pea gets out of its own compartment, Logan's right there, guiding it back to its home. 8. Model eating and enjoying varied foods. In order to encourage Logan to try new foods without putting any specific pressure on him, we often talk about what we are eating during meals. For instance, I may say to my husband "mmm, daddy, these peas are so good! Do you like them too daddy?". To which my husband will obviously respond "mmm... so good". Now, clearly, this will only work with toddlers. When Chloé is eating something new, I'll comment, "Look! Chloé's eating a muffin! She likes the muffin." Without making it into a criticism that Logan won't eat that food or making it into a competition. I simply say it as a passing comment. And sure enough, he will sometimes pick up something new to try. Sometimes, he picks it up, moves it towards his mouth and says "no". And that's fine too. 8. Use shaping to progressively work towards your feeding goals. There is a bit of a pervasive belief in our society that when a child does something they shouldn't, they need to be told 'no', punished and told what they should have done. While I don't disagree that children need both limits and consequences, there is no question in my mind that positive reinforcement is a much stronger tool than punishment. We try to steer clear of any criticisms of what Logan isn't doing well at the table, but rather, reinforce any approximation of the behaviour we are working towards. For instance, the other day when Logan picked up a cucumber and put it back down, I said to him "I like how you just picked up your cucumber". Clearly, I would love for him to eat the darned thing. But picking it up is one step closer to eating it than leaving it on his plate is. The trick here is to use baby steps to work towards what you ultimately want the child to do. And to praise, praise, praise every time the child gets one step closer. This is something I know almost innately, from my career as a Speech-Language Pathologist. And it can work for essentially any behaviour, if done consistently. The balance of positive to negative reinforcements should always be a minimum of 10:1. Pay attention to your verbal interactions with your children. Parents' instincts tend to be to comment on what the child is doing wrong. For instance, to say "no pushing", instead of saying "gentle hands", or "I like how you were gentle with your sister". For each time you give your child a negative reinforcement, such as "no pushing", he should hear 10 positive reinforcements. And quite, honestly, I doubt there are many parents who meet that criteria (my husband and I included). But we can do our best to strive towards this. 9. Without putting too much pressure on the child, encourage him to try new foods - while redefining the meaning of the word "try". "Trying" a new food does not necessarily mean putting it in your mouth and swallowing it. There are many steps to get a child to eat a new food. And you need to work your way up the hierarchy of these steps to get the child to accept trying the food. You need to do something that is only one step more difficult for the child than what they can currently tolerate. This is the only way that you will experience any success. For instance, if the child cannot yet tolerate being in the same room as a food, expecting the child to eat that food is much too advanced of a goal. A more reasonable goal would be working towards getting the child to accept being in the same room as that food, even it is has to be at the opposite end of the room. If a child will not yet tolerate a food on his/her plate, that would be a reasonable goal to work towards, even if it only remains on the plate for a few seconds. You can find more detailed information on these steps here. We have been fortunate enough that we haven't had to do every step on the hierarcy. We started by using a bowl next to his plate to get him to tolerate new foods on his plate. From there, we were able to go straight to kissing foods. 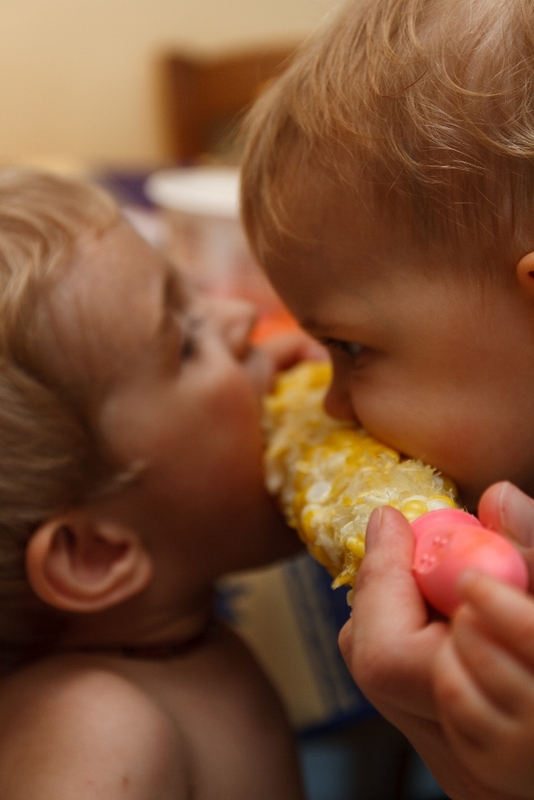 We have had a routine of kissing all of our foods goodbye before we put them in garbage. You can see in the above video that Logan doesn't love the feeling of the foods on his lips, but he will tolerate them. So we continue doing it, all the while praising him for kissing them. Logan very quickly started trying waaaaay more new foods when we began this kissing. Some days, he would kiss something and then immediately say "Logan try" (which just flippin' blew me away!!). This is how he fell in love with his new best friend, "guaccoli" (guacamole). In fact, this is also how he began eating hummus, carrots, watermelon, peaches, red lentil soup... the list goes on. As a side note, had Logan not been tolerating the kissing relatively well, he would have been the one holding the spoon. But this video was taken when we had already been doing this for awhile. P.S. Notice how he asked for dessert at the end of each video? He so knows kissing is part of the routine to get him dessert. As much as I did not want to EVER use dessert as a reward, we have been encouraged to do so by our OT, to help encourage him to do whatever step we are working on (i.e. kissing). We are now working more on having him hold things in his mouth for a second and spit it out. He's more reluctant to do this, but we've managed to get him to do it a few times. We make it into a game. We all do it at the table and he ends up giggling and, often times, joining in. In any case, each parent needs to decide what step is appropriate for their own child. Keep in mind that, in choosing an appropriate stage, you need to consider not what you want the child to be able to do, but what he/she is currently able to do. And you then need to pick a step that is only slightly more advanced than what he/she is able to do now. If you pick something that is much more advanced than what the child is already able to do, you will be setting him up for failure. This will only lead to increased stress for the child and the parents. 10. For children with oral hypersensitivity, use desensitization techniques to increase tolerance of food in the mouth. One last tip that is probably only pertinent to children who are having feeding issues due to sensory problems. Logan's issues are related to a hypersensitivity in his mouth. The feel of food in his mouth bothers him much more than other people. Because he can actually feel the food in his mouth much more than we can. He can gag and throw up on something as simple as a little piece of cracker in his mouth. In order to help desensitize his mouth, OT recommended we use a disposable vibrating toothbrush and start brushing the inside of the cheeks, tongue, palate, etc. You let them do it first and only do it if they accept it. No forcing of anything. If the child does not yet accept a vibrating toothbrush, you can try brushing the inside of the mouth with a regular toothbrush. And if the child won't let you do it, try to encourage them to do it themselves. There also exist a few chewy toys that can help desensitize the mouth, such as the Nuk brush or chewy tubes. We purchased a few of each of these so that the kids can always be wandering around the house, gnawing on these, giving themselves their own occupational therapy. So there you have it. This is what I've learned so far. And I'm sure there will be lots more to come. And last night, Chloé even ate some red lentil and carrot soup with coconut milk (with the veggies puréed/grated) followed by a peach muffin. And I almost died! Love learning what some of our next toddler years steps for feeding with Maddy will be. Also, love times a million that he loves his construction plate :) Auntie Ash for the win!!! It definitely sounds to me like you have a resistant eater on your hands. And no, you are not mad. You are sensitive to your child's needs and the signals he is sending you. People who have not lived it cannot understand and many are unwilling to even consider that what you are saying might make some sense. I encourage you to continue to trust your gut. I don't know what area you live in, but I'd recommend you look into finding either a Pediatric feeding program at a hospital that specializes in children with feeding disorders (and NOT eating disorders, as this is an entirely different beast), or an Occupational Therapist or Speech-Language Pathologist who has experience in this area. If you let me know where you are, I could give you some guidance in finding something appropriate. In my opinion (as an SLP myself, who has now been trained to work with resistant feeders), you have to be very careful in choosing a program, to select one that never forces the child to try something, but, rather, encourages them to explore new foods through a variety of senses, without pressure being placed on eating. The training I went to also said to never modify a preferred food in any way (even cutting it into a different shape) when the child has a very limited repertoire, because you risk the child refusing that food from now on too. Which is exactly what happened with your son and his drinks. I learned that the hard way too, by trying to sneak some hemp seed into their oatmeal one day. Then I lost the one breakfast food everyone would eat. Thankfully for us, things are much better around here lately. I hope that you will be able to find the help that you need with your son. excellent post, I'm currently researching techniques to try w my eight year old resistant eater. Some great idea, thanks! Thank you so much for your information and techniques. I plan to put them into action with my three year old son. He runs out of the room now with any new food so I know I have a long road ahead of me. But I have hope after seeing what Logan had done. Tell him he is helping other children! I was tearing up with the pictures of him eating! Good job mom, dad and Aunt Ash! You might want to read some of my posts under the 'sensory processing disorder' down the left and see if any of this maybe rings a bell, as what you are describing sounds much like my life. The only other thing that I can say is hang in there and don't blame yourself for not getting help sooner. We can only make decisions based on what we know at any point in time. I think that part of why my kids got such early intervention is because I am a therapist myself, so I probably knew more what to look for than other parents. Plus, my niece was experiencing similar issues and had already been identified. It's hard not to blame yourself, but really, the best thing you can do for both you and your daughter is just to seek help now. If you e-mail me your e-mail address to lindsay.orthophoniste@gmail.com I'd be happy to share with you a presentation I gave recently to parents of picky feeders. Hi, I'm so enlightened with your article. Knowing that I have been dealing with a resistant eater all along, not just picky eater. And also knowing that I'm not alone. My daughter is now 3 years old and just usually eats bread and butter and nothing more afterwards. One thing that I'm concerned about is how she eats. It takes her a long while to swallow the food in her mouth. She eats really slow, about more than an hour to finish her food. In some instances that she likes a certain food, she still eats the same way. At times when I ask her is she finish eating yet cause everyone has finished eating already.. She'll say "not yet" even if the food has been sitting in her mouth for more than an hour already. She won't let me clean up her plate and she won't take another bite yet. Most of the time her breakfast meal would still be around at lunchtime with her mouth still full with her first bite. What should I do? Anonymous, sorry that it took me so long to respond. I hope you will get this feedback. You daughter keeping the food in her mouth for a long time could be due to weak oral motor skills needed to move the food around in the mouth and chew. Her tongue may not be able to move food to the back teeth to chew. You can chew on long hard, stick shaped objects (peeled and dried carrot sticks, celery, dried licorice, beef jerky, etc.) to help develop the required tongue reflex. Also chew with your mouth open sometimes and talk about what you are doing with your tongue to move the food, with your mouth to chew, etc. And be sure that pieces given are relatively small so that he has less work to do to break them down, particularly for foods with more difficult textures (i.e. meat). Does your daughter have low muscle tone? Only because this can impact oral motor skills for feeding. If so, I'd be sure to get her sitting in something with appropriate postural stability (90 degrees at back, hips and knees). Pretty much the position that a Tripp Trapp chair would put her in. You can do it cheaper by using rolled up towels at his back and sides, if necessary, and phone books taped together and under the feet to get the knees at a 90 degree angle. To get an idea of what it feels like for kids to sit unsupported during meal times, sit in a chair and lift your feet off of the ground for a few minutes and see how long your endurance lasts. Giving the child postural stability support can alleviate this work, so that their resources are more available for chewing. It could also be a sensory need that your daughter is trying to fulfill rather than due to poor oral motor skills (or a combination or both). One way you can tell if she can chew adequately or not is to take a saltine cracker and have both her and yourself chew it 5 times and then open your mouths. Compare what yours looks like and where it is in the mouth compared to hers. If she has pushed it up into her palate instead of chewing it, this is a sign of poor oral motor skills. I'm so thankful for your response Linds. We've tried the Saltine Crackers and turned out that she liked it and she was able to chew it well. I believe she only chews what she likes to eat. I also followed your advice about appropriate postural stability. And has included one of your advises in "ten-tips-for-pickyresistant-eaters" article, also started practicing the goodbye "kissing" of foods after mealtime. I guess one of the reasons why she don't find mealtime fun is because we had been pressuring her to eat since her first weaning. It gotten worse when we found out that she has a condition called right agenesis of the kidney. We got scared feeding her anything containing salt that she won't eat any bland meal (who would?) but still forced her to. Or I guess we had been over acting about her sodium intake. As of now, I'm back to zero trying to let her try new foods. And I believe I really need a lot of patience than before since she's practicing more independence in food selection in this stage. I'm still on my quest to understand more about her problematic eating. I even watch jo frost extreme parental guidance. And of course, I always find your articles very helpful and will continue to read more. I can say that there was an improvement (after the new mealtime routine). I know I still have a long way to go. Although she still eats very limited food preference, I'm hopeful that she'll try some more or at least one at a time, new foods. We live here in the Philippines, by the way. I may open up more about her feeding problem with her pediatrician. She knows my child is a picky eater but the pediatrician told me that my child might outgrow the picky eating and so she recommended that I give her PediaSure Milk Formula to balance her nutrition. More power to your blog. I know more parents are grateful they came across your articles. I'm glad to hear that this helped. It is definitely a long road and you will need to focus on the little improvements so as not to get frustrated. Kids certainly don't turn from picky eaters into typical eaters overnight and it is frustrating at times how slow the progress can be. You will also probably find periods of regression (like after a child is sick). But don't lose hope, as they usually don't last long and the child goes back to eating like before. My gut tells me that it likely isn't that she chews what she likes, but more what she can handle (be it from an oral motor or a sensory standpoint). Research shows that somewhere from 90-97% of kids with significant feeding issues have some sort of underlying real problem that is causing the feeding issue. Just keep this in mind, since when we view it as behavioural, we tend to approach the child differently (i.e. get frustrated more easily, pressure the child to eat more, etc.). I have never heard of Jo Frost Extreme Parental Guidance, but be careful is this approach advocates making your child eat what is served, etc. I always be sure there is one thing on the plate the kids will eat and then let them do as they please - even if they only eat rice for dinner. It will get you much further longterm than an approach where the child is served with a plate full of foods they won't eat and then pressured to eat. On that note, don't beat yourself up for having tried to pressure her to eat. This is a very natural response and one that I see commonly. Parents are concerned that their child is not eating enough and it is often the only way that parents know to try to get their child to eat more. Unfortunately, it typically makes things worse. Mealtimes are definitely always stressful when you have a picky or resistant eater. Let's face it, mealtimes are even stressful for parents with typical eaters so when you throw in a child who won't eat and does anything they can to get out of it, it can just lead to chaos! If there are concerns about your child's nutrition or weight gain, Pediasure can be a good temporary supplement. However, I would only introduce it if there are really nutritional or weight concerns (best to speak with a dietitian to determine if this is necessary). If there are no such medical concerns, I would avoid it, only because the child can then fill up on Pediasure instead of developing their eating skills. That being said, for some kids, it is a necessity and, in those cases, should be used. Good luck! Let me know if any questions come up. Oh!! I think my 3 year old is more than just a picky eater! This kid hasn't had dinner for like a year because I thought eventually he would get the point that I'm not making him something different. I have a list of 16 foods he will eat, and even those things are hit or miss. People keep saying to have one food on the plate that everyone will eat, but he will rarely even eat those things. Now, he has a few sensory things, but I am pretty sure he doesn't have enough to be diagnosed with anything. We do have a few sensory processing nieces and nephews. He also doesn't gag at the thought of new food. He does have a lot of anxiety over what's for dinner. I did get him to smell some food last night! So, I think we need help but I am worried we won't be able to get it since he is not on the he spectrum. What should I do? How do I go about getting help? We just had his 3 year old check up, but I don't think I helped the doctor realize how bad this is! Where are you located? I am in Canada, so can't give you much guidance as to what does and does not qualify for services in the States. Here in Canada it varies regionally, but, unfortunately, a lot of kids with these types of difficulties do not qualify for much in the private sector. Though kids on the autism spectrum do very frequently have sensory difficulties, sensory problems do not necessarily mean autism. They can be independent of any other diagnosis, or can be early signs of other conditions (such as AD(H)D, for example). I thought the same as you... that if I just kept exposing them, they'd eventually give in and just eat what I was serving. That is, until I realized that they were unable to tolerate a lot of the foods. In terms of serving something you know he can eat, I'd always serve one of the 16 foods on his safe list. Try to alternate, so as not to present the same food twice within two days (I know this is hard! ), as this can actually make them even more rigid in their food choices. I'd also try to make eating a no pressure situation. He eats if he wants, he doesn't if he doesn't, and you don't care what he does or doesn't eat or whether he eats at all. It's important too to learn to actually not care rather than to pretend you don't care, as kids can read our non-verbal signs very easily. I'd try to gradually get him to interact with foods in progressively more difficult ways, all the while being very sensitive to signs that it is too much for him, and backing off the minute you sense discomfort. No pressure! :) Try to get him to smell, touch (passing to someone else with a fork, then with his hand, then touch to his lips, etc. ), then kiss, lick, etc. new foods. No forcing. You do it and make it play and try to encourage him to join in on the "fun". Outside of this, if you are looking for therapy for him (which I'd recommend if you are able to), I'd try to find an SLP or OT who has experience working with children with feeding difficulties. Be sure to do your research and find out what type of an approach they use. I'd recommend a positive reinforcement approach rather than negative reinforcement, as studies show that although initial progress is a bit slower, the gains are maintained. In contrast, with negative reinforcement programs (i.e. you get a sticker when you try something new), the child often stops eating the food once the reinforcement is faded, so there is little generalization. Good luck :) Let me know if you have any other questions. I know this post is old so I am not sure your even responding anymore but came across this when I was doing research on my son. He is 3 years old and everyone said he was just a picky eater and it was because we accommodated to him but I thought more and when I came across problem feeder/ resistant eater it fit my son for the most part. He use to eat a variety of things but now he eats the same exact thing for breakfast lunch and dinner ( the actual food is different for each meal but same thing everyday) he refuses to,try anything new and our pediatrician told us to starve method which diidnt work and I felt horrible. I love your tips and can't wait to start trying them. My question is do I still give him the same thing everyday and just add something small new to the plate at each meal? I would appreciate any advice/ tips you could give. The rule of thumb is to always serve at least one food that you know he likes (whether he chooses to eat it or not will be up to him). Then you can serve whatever else you want. The whole family gets the same meal. So if his tastes are so limited that you don't really want to eat what he eats, the food he likes in the meal could be something like bread. Though I'd vary the "safe food" from meal to meal. At first, our meals didn't always really "match". For instance, I might have served chicken with rice and veggies, with hot dog pieces on all of our plates too, since that was the "safe food". I'd put just a few pieces on our plates. The child can have as much access to the safe food as they want. But over time, exposing them to the other foods (with zero pressure to try) should lead to the child eventually trying other foods. If he can't tolerate the other food son his plate, you put them on the learning plate, just beside his plate. I'd avoid giving him his usual meals and just adding foods, as this he'll be able to fill up enough on his usual meal to not have much reason to try other things. Plus, he'll be able to eat a couple of different things, which will also not encourage him to try new foods. The other thing is that you'll need to learn to be able to tolerate him eating a small variety of foods per meal for now. Nutrition wise this worries a lot of parents. But I feel that the short-term loss of nutrients is worth it for the long-term gain of them eating more balanced meals. 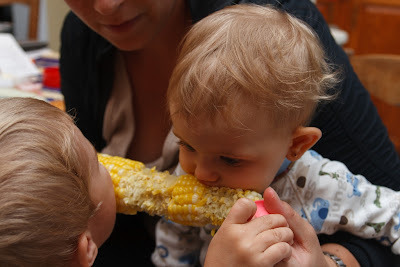 We went through many, many, many meals where my kids ate only corn. Or only rice. Or blueberries. And they're still alive and seem pretty healthy. Plus, they mostly eat the meat, veggies and starches on their plates without too much issues, despite the extreme restricted tastes they once had. Wow! As I wiped away my tears away while reading this because it is my son exactly and my husband and I go through stages of trying to get him to eat and leaving him alone, it is good to see we are not alone in all this. I tried to get people to believe me when my son was 9 months old that he was tongue tied but I was always told I was wrong. At just over 3 years old, he had surgery to untie a complete tongue tie on both the top and the bottom of his tongue. He just turned 4 and although I have managed to get him to eat enough and a decent quality of food to keep him growing (for now) he has such anxiety and fear and will definitely not consider anything new. I've often said, he would rather starve then eat something new. It is comforting to see your tips and know that I do some of them so thank you again for posting! Thank you for posting such a nice article. I’m gonna glance once in awhile on your page to see and read more of your works - great! My daughter went through a period where she wanted salad bkfast, lunch and dinner - the problem was she wld get the runs. So I made a rule that she cld only have it 1x p/day and I usually do that with things that become her new favs. Our current problem is nothing she has previously liked is appealing to her, so she is eating very little. I keep telling her that she may have to try something new since everything she's already eaten she doesn't seem to want. What do you suggest? I am glad I came across this bc she definitely falls into the category of resistant eater and I have not always followed the tips you suggest, as far as ways to introduce new foods or pressuring her to eat something. When she is "on" with a food she will sit for hours eating. She is a bottomless pit. And we often have to say okay that's it. Take a break and you can eat again in a little while. She is not overweight by any means and is in fact off the chart with her ht and weight for her age. She has epilepsy and multiple delays. This is the longest pause she has had in between foods where she dislikes what she's been eating and chooses another food. Thanks for your help!! I will definitely employ some of the tips given!